Shavuot is the yehrtzeit of the Baal Shem Tov, the founder of Chassidism, and Rebbe Nachman's great-grandfather. It was the beginning of the 18th century and Jews throughout the Ukraine could not stop talking about the new rabbi who had just moved to the town of Mezibuzh. "He understands the depths of the Torah," said some. "He can perform miracles and see the future," said others. Even Reb Dov Ber, a Torah scholar of note who would later become famous as the Maggid of Mezritch, could not help but be impressed by the stories he heard about the new rabbi, the Baal Shem Tov. He decided to travel to Mezibuzh to see the Baal Shem Tov for himself. Reb Dov Ber spent an entire Shabbat waiting impatiently to hear pearls of wisdom from the Baal Shem Tov-something that would prove that he was more than a simple storyteller. But instead of dazzling Reb Dov Ber with deep words of Torah, the Baal Shem Tov told stories, sang zemirot (Shabbat songs) and ate his Shabbat meals. On motzaei Shabbat, a disappointed Reb Dov Ber packed his bags and set out for the long journey home. Just as Reb Dov Ber left the beit midrash, one of the chassidim came running after him. "The Baal Shem Tov wants to speak to you," he told Reb Dov Ber. Reb Dov Ber returned to the beit midrash, set his bags on a bench and entered the Baal Shem Tov's study. The Baal Shem Tov asked him to explain a difficult pshat (meaning) in the Eitz Chaim, a major kabala sefer. Reb Dov Ber duly opened the sefer and proceeded to explain the simple meaning of the words. "You understood the pshat," said the Baal Shem Tov, "but it was missing its neshama, its soul." The Baal Shem Tov then opened the same sefer and explained the pshat in exactly the same way as Reb Dov Ber. But as he was saying it, loud claps of thunder were heard and angels could be seen flying around the room. "That," said the Baal Shem Tov, "is how you must understand the Eitz Chaim." The Baal Shem Tov had the unique ability to understand the depths of the Torah and share this understanding with others. Through his stories and parables, he was able to give even the simplest of Jews a better understanding of the Torah's penetrating wisdom. Through his profound explanations of the deepest secrets of the Torah, he was able to influence and teach the greatest Torah scholar who became leaders of the Jewish People, spreading the teachings of Reb Yisroel and Chassidut. These were his contribution to the world. Reb Yisroel, more commonly known as the Baal Shem Tov, was born on 18 Elul, 1698, in Okop, a tiny village in Poldolia, Ukraine. His parents, Reb Eliezer and Sara, were known far and wide for their generous hospitality. They would send people to search the countryside for beggars who were in need of a place to stay. Then they would bring them to their home and serve them a delicious meal. Before the guests left, they made sure to provide them with provisions and money that would last for several days. Eliyahu Hanavi (Elijah the Prophet) was once sent to their home to test their sincerity. Late one Shabbat afternoon, Eliyahu banged on their door, demanding a meal and a place to spend the night. He had a staff in his hand and a knapsack on his back-clear indications that he had been desecrating the Shabbat. Reb Eliezer himself opened the door. "Gut Shabbos," he warmly greeted his guest. "Welcome to my home." Although Reb Eliezer understood that the beggar had violated Shabbat, he pretended not to notice and quickly invited him inside. "We're in the middle of eating shalosh seudos, the third meal," Reb Eliezer told his guest. "Please, come and join us." The moment Shabbat was over, Sara prepared an elaborate melava malka for the guest and then provided him with a comfortable bed. The next morning, Reb Eliezer and his wife prepared to send the beggar off with a generous donation, as well as provisions for the way. Not once did they mention a word about their guest's shameful conduct the previous day. Reb Eliezer and his wife passed away when the Baal Shem Tov was still a young child. His father's last words to him were, "Fear nothing other than Hashem." Although the Baal Shem Tov continued his formal education in cheder, he would also spend hours alone in the forest, pouring out his heart to Hashem and meditating on His greatness. When the Baal Shem Tov entered his teens and the community's responsibility to support him came to an end, he was entrusted with escorting the small children back and forth to cheder. As he walked with his young charges, he taught them to say Tehillim and would even bring them to shul to answer "Amen" after Kaddish. Before bringing the children to their homes, he would plant a kiss on each of their foreheads. His love for children was so great that years later the Maggid of Mezritch commented, "If only I could kiss the sefer Torah with the same love that the Baal Shem Tov was able to show a small Jewish child." Several years later, the Baal Shem Tov became the caretaker of the local shul. This job did not take up much of his time and he was able to devote his nights to Torah study. The Baal Shem Tov was careful to hide his greatness, and the people of the village assumed he was an ignoramus. It was during this period that Rabbi Adam Baal Shem, a hidden tzaddik, instructed his son to bring the Baal Shem Tov secret kabalistic writings. Through studying these manuscripts, the Baal Shem Tov was able to develop an extraordinary understanding of the Torah's depths. It was also during this period that the Baal Shem Tov married his first wife, who passed away shortly after their wedding. The Baal Shem Tov eventually moved to a small village near the city of Brody. There he did not hide the fact that he was a Torah scholar, and although he taught in a cheder, the community held so highly of him that he was often asked to arbitrate dinei Torah, Torah laws. Rav Efraim Kitover, the Av Beit din of Brody, was once involved in a din Torah arbitrated by the Baal Shem Tov. The moment the Baal Shem Tov saw Reb Efraim, he realized that Reb Efraim's daughter was destined to become his wife. Rather than hide his brilliance, he "talked in learning" with Reb Efraim and literally dazzled him with his depth of knowledge and sharp intelligence. Reb Efraim returned to the Baal Shem Tov's house later that day to suggest a shidduch between his daughter, Chana, and the Baal Shem Tov. Of course, the Baal Shem Tov was interested in the shidduch, but there was one problem. "Many of the wealthy members of the community would like me to become their son-in-law," he told Reb Efraim. "Therefore, this shidduch must be kept a secret. It would not be proper to hurt their feelings after they have treated me so kindly." Reb Efraim and the Baal Shem Tov wrote out the tenaim, the marriage agreement right then and there. The Baal Shem Tov refused to allow Reb Efraim to put any titles next to his name-he insisted that it be written, "Yisroel, the son of Eliezer." After the engagement was finalized, Reb Efraim returned home, without telling anyone what had transpired. Shortly afterward Reb Efraim became ill and passed away. When his son, Reb Gershon Kitover, organized his father's papers, he discovered that his sister was engaged to some unheard of person named "Yisroel." Meanwhile, as soon as the school year finished, the Baal Shem Tov set off to Brody to marry his bride. Before he arrived at his future wife's home, he changed his clothes and disguised himself as a simple peasant. Dressed in an old sheepskin coat and battered hat, the Baal Shem Tov began to loudly bang on the door of his brother-in-law's home. Reb Gershon assumed that the Baal Shem Tov was a beggar and handed him a small donation. He was completely dumbfounded when the Baal Shem Tov showed him his copy of the tenaim. But he was even more shocked when he heard the Baal Shem Tov gruffly say, "Bring me my wife." Reb Gershon was appalled that his father had made a shidduch for his sister with such a simple man. "Chana," he told her, "I can not understand why our father would have done such a thing. It must be a mistake and you do not have to marry him." But Chana had complete faith in her father's judgment and was sure that this man must be her destined mate. A few weeks before the wedding, the Baal Shem Tov asked to speak privately with his future wife. At this meeting, he revealed to Chana his true identity and asked her not to divulge his secret. After the wedding, Reb Gershon attempted to teach his new brother-in-law Chumash. The Baal Shem Tov, however, pretended not to understand a word of what was being taught. Embarrassed about how other people would react to his boorish brother-in-law, Reb Gershon asked him to leave town as soon as possible. The Baal Shem Tov and his wife settled in a small village in the Carpathian Mountains between Kitov and Kussov. Chana dug clay while her husband devoted his days and nights to Torah study. During this period, the Baal Shem Tov reached such a high level in his Divine Service that it was said that Eliyahu Hanavi and Achiyah Hashiloni revealed themselves to him and taught him the secrets of the Torah. Seven years later, at the age of 36, the Baal Shem Tov finally came out of seclusion and began to reveal his true self to the world. 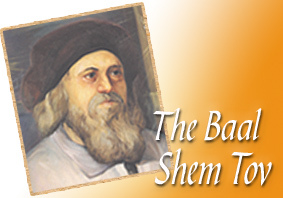 On Lag Ba'Omer, 1734, the Baal Shem Tov began to teach others what he had learned. His teachings, which eventually became know as Chassidut, connected every aspect of life to the Torah itself. Shortly afterward, the Baal Shem Tov moved to Tlust. There he gained a reputation as a miracle worker. Thousand of Jews in distress came to Tlust to receive words of encouragement and blessings. From Tlust, the Baal Shem Tov moved to the city of Mezibuzh in the western Ukraine, where he lived and taught for the rest of his life. It was from there, as well, that his fame spread throughout the Ukraine. In Mezibuzh he built a core group of chassidim from the many scholars who, like Reb Dov Ber, came to see if he was truly as great as they had heard-and eventually became his disciples. The group included Reb Dov Ber, the Maggid of Mezritch, who eventually succeeded him as the next leader of the Chassidut; Reb Yaakov Yosef of Polonoye, the "Toldot," who recorded the Baal Shem Tov's Torah; Reb Meir Margalis of Ostragh; Reb Nachum of Chernobyl; Reb Yitzchak of Drohovitch and his son Reb Yechiel Michel, the Maggid of Zlatchov; Reb Nachman of Kossov; Reb Yeshaya Miyanov; Reb Moshe of Kitov and others. There are literally thousands of stories about the Baal Shem Tov's miraculous and unusual solutions to the many difficult problems that were facing the Jews in the Ukraine. One such story is about Reb Moshe, a simple but God fearing Jew who ran a tavern in one of the small villages surrounding Mezibuzh. One year, most of the crops in the area died because of a drought, and the farmers were left with very little money to spend on liquor. Without his usual customers, Reb Moshe was not able to pay the rent on time. Reb Moshe found the courage to go to the count's palace and ask for an extension on his rent. The count, however, not only refused, but also ordered his servants to physically throw Reb Moshe out of his home. While the servants were dragging Reb Moshe away, the count continued to shout after him, "If you do not bring me the entire sum by the beginning of next week, I will toss you and your family into the dungeon. The tavern will be leased to someone else." Reb Moshe returned home a broken man. "Where will I find such an enormous sum?" he cried to his wife. "How will I ever get out of this terrible mess?" Reb Moshe's wife suggested that he travel to Mezibuzh to ask the holy Baal Shem Tov for advice. "Certainly," she told him, "such a great tzaddik will find a way to help us." The moment Reb Moshe stepped into the Baal Shem Tov's beit midrash, he became overcome with a sense of awe and reverence. When he finally stood before the Rebbe, he was at first so overwhelmed that he was unable to say even a single word. But with the Rebbe's prodding, he finally shared his story. "A Jew should never despair," the Baal Shem Tov told him. "Trust in Hashem and he will certainly not abandon you." When Reb Moshe heard these words, he felt as though a heavy load had been lifted from his shoulders. "Tomorrow," the Baal Shem Tov continued, "I want you to go to the marketplace and buy the first item that is offered to you." With that, the Baal Shem Tov handed him a small coin. "After you buy it," continued the Baal Shem Tov, "bring it back to me and I will tell you what to do next." Although Reb Moshe left Mezibuzh with a light heart, the closer he came to home, the more downcast he felt. All of his earlier fears and doubts resurfaced. How could such a small coin possibly help him? Reb Moshe's wife, however, trusted in the Tzaddik. She was convinced that since the Baal Shem Tov had instructed her husband to buy something with the small coin, the coin would bring the salvation. The next morning Reb Moshe hurried to the local marketplace. While walking among the stalls and examining the different goods, he was approached by a young peasant who offered to sell him a sheepskin. Reb Moshe followed the Baal Shem Tov's instructions and bought the sheepskin. Reb Moshe rushed back to Mezibuzh with the sheepskin. The Baal Shem Tov examined the sheepskin and began to comment on its beauty and fine quality. "In another few days," the Baal Shem Tov told him, "the count will make a huge banquet in honor of his birthday. All the nobility will be coming with beautiful presents. I want you, his tenant, to bring him this sheepskin as a birthday present." Reb Moshe took the sheepskin and returned home with a heavy heart. The moment he entered his home, he poured out his tale of woe to his wife. "The richest men in Poland, will be attending this party and bringing extravagant presents in honor of the count's birthday," he said. "The count himself owns thousands of flocks of sheep. He will think that I have come to ridicule him when he sees the present I have brought him." "Who are we to question the words of the Baal Shem Tov?" his wife responded. "You must do as he said, and Hashem will help." The count's birthday arrived. Hundred of noblemen went to his spacious palace bearing impressive presents, each one worth a small fortune. Reb Moshe, as well, arrived at the count's home, carrying the sheepskin over his shoulder. The count's servant immediately ushered Reb Moshe into the main hall. Waving the sheepskin high in the air, the servant proclaimed, "Your Highness, here is a present from Mosh'keh, your tavern keeper." The servant placed the sheepskin in front of his master, but the count pushed it away in disgust. "What type of present is this?" he asked. "Take the Jew and throw him into the dungeon. And for good measure, be sure to beat him soundly on the way." One of count's guests, however, picked up the sheepskin and began to look at it closely. "What an amazing sheepskin," he remarked. The man took the sheepskin and spread it out on the table. In the very center of the sheepskin, the wool had been skillfully woven to into an exquisite design that included the count's name, his birth date and his family's coat of arms. The other guests stood in wonder. This was truly a work of art! The count could not believe that his Mosh'keh had given him such a valuable and unusual gift. Right then and there, he commanded his servant to bring the Jew back to the main hall. The moment Reb Moshe was brought back into the hall; he threw himself at the count's feet. "Please," he begged, "have mercy upon my wife and children. I did not mean to insult or embarrass you with my simple gift." But the count merely wished to thank his tenant for his unusual present. "Tell me," he asked him, "who is the gifted artist who created such a masterpiece?" Reb Moshe was confused. He had not the slightest notion what the count was referring to. Slowly he began to tell the count how the Baal Shem Tov had helped him. At the end of the tale, the count stood up in front of all of his guests and proclaimed, "Mosh'keh, I want to show my heartfelt appreciation for your unusual and exquisite gift. I hereby grant you your tavern as a present. From now on, you will never have to pay rent again." On another occasion, the Baal Shem Tov instructed his chassid, Reb Wolf Kitzis, to look for a suitable match for his daughter. Reb Wolf, however, could barely manage to put food on the table, let alone provide his daughter with a dowry. "How can I possibly find the money to marry her off?" he asked the Baal Shem Tov. But this did not faze the Baal Shem Tov. "Tell the shadchanim in Jassy," he told his chassid, "that you are willing to provide a dowry of two thousand silver rubles. I am sure that with such a dowry you will find a suitable groom for your daughter." Within a few weeks a wonderful shidduch was suggested. Several days later the two sides finalized the match. Reb Wolf was ecstatic that he had found such a special young man for his daughter. But he still had no idea how he would pay the 2,000 rubles. The moment Reb Wolf entered the Baal Shem Tov's study, the Baal Shem Tov rose from his chair and wished him a hearty "Mazel Tov." When Reb Wolf expressed his concern about how he would pay the dowry, the Baal Shem Tov quickly reassured him. "Hashem will surely help you," he told him. "You will be able to fulfill your promise." A few weeks later, Reb Wolf received a letter from the groom's father, expressing his surprise that his son had not yet received the customary presents. When several weeks passed by without a reply from Reb Wolf, the groom's father threatened to break off the engagement. Reb Wolf was shaken to the core when he received this letter and, with a heavy heart, he showed it to the Baal Shem Tov. The Baal Shem Tov was not concerned. "Send a letter to the groom's father," he said, "informing him that his son will receive both the presents and the dowry when he comes for the wedding." Several days before the wedding, Reb Wolf once again set out to visit the Baal Shem Tov. He was frantic with worry; the groom's family was supposed to arrive in two days and he still did not have the money for the dowry. On his way to the Baal Shem Tov's home, Reb Wolf met a stranger who asked him where the Baal Shem Tov lived. Together they walked into the Baal Shem Tov's home. A wealthy merchant was once returning from a successful business trip with 40,000 rubles in his pocket. Exhausted from his travels, he soon fell into a deep sleep. This was the moment that the driver had been waiting for; he turned the wagon off the narrow road, drove into the depths of the forest, and robbed his passenger of his money. The merchant was terrified. It was obvious that the driver was planning to murder him as well. "Please," he begged, "at the very least, allow me to say Viduy before I die." Amazingly enough, the robber agreed. He tied the merchant to a large tree and gave him a few moments to recite Viduy. As soon as the robber turned his back, the merchant began to cry to Hashem. He promised that if he would survive the ordeal, he would give one tenth of the money that had been stolen to tzedaka. Just then, a group of soldiers walking in the forest heard his bitter cries. They ran to see what had happened and discovered the merchant tied to a tree. After they untied him, it only took a few more minutes before they apprehended the thief and returned the money to the merchant. The merchant, still shaking from fear, could not believe the miracle that had happened. "The minute I get home," he said to himself, "I will fulfill my promise and give four thousand rubles to charity." But the moment he arrived home, some pressing business matter came up and he was unable to fulfill his promise. Every day something else came to keep him from fulfilling his vow until eventually he forgot about it completely. Then, suddenly, his son became desperately ill. Although the merchant called in the best physicians, they were unable to help him. "Only a miracle," the doctors told him, "will save your son's life." It was at this point in the story that the Baal Shem Tov paused. The merchant who had walked into his study with Reb Wolf had begun to sob quietly as the Baal Shem Tov told his story, and when the Baal Shem Tov mentioned the sick child, he began to cry hysterically. He was the merchant in the story, and the sick child was his own son. "Rebbe," he cried, "now I realize why my son has become ill." The merchant counted out 4,000 rubles and handed them to the Baal Shem Tov. The Baal Shem Tov immediately gave the money to his Reb Wolf. With the 4,000 rubles Reb Wolf was to shower the groom with presents, pay the dowry and make a beautiful wedding. And the merchant returned home the following day, he was relieved to find that a miracle had taken place-his son was on the road to recovery. The Baal Shem Tov was also able to understand the inner meaning of events, as the following story illustrates. Once, a childless woman came to the Baal Shem Tov and begged him to give her a blessing for a child. He agreed, and a year later she gave birth to a healthy baby boy. When her son was 2 years old, she brought him to Mezibuzh to receive a blessing from the Baal Shem Tov. The Rebbe took the baby in his arms and kissed him tenderly before returning him to his mother. As soon as the woman returned home, however, the baby became ill and, within a few days, passed away. The woman was heartbroken. She returned to the Baal Shem Tov and cried bitterly, "Rebbe, why did you bless me with a son that would only live two years? What type of a blessing is that?" There once was a king had no children. One of his advisors told him that his dream of having a child would only be fulfilled if the Jews were to beseech their God to grant the king a son. The king threatened the Jews with expulsion from his kingdom if his wife would not give birth to a son by the end of the year. The Jews, of course, turned to Hashem and begged Him to save them. A certain holy soul in heaven heard the cries and offered to be sent down to this world to save the Jews in this kingdom. Within the year, this soul was sent down in the body of the king's newborn son. This little child was very special. As soon as he turned two, the queen stopped nursing him and the king began to teach him to read. He advanced so rapidly in his studies that, although his father hired the best tutors, he outgrew them all within a very short amount of time. The king summoned the priest, who was known far and wide as an extremely wise man, and asked him to tutor his son. Although the priest was willing, he had one request. "Every day," he told the king, "I spend two hours alone in my room. That is when I ascend to heaven. I would like you to forbid your son from entering my room during those two hours." The king agreed. A few days later, the priest moved into the king's palace. Every day he spent his entire day-except for those two hours-teaching the young prince the wisdom of the world. Within a short time, the prince, too, turned into a wise and knowledgeable young man. There was one thing, however, that the prince could not understand. What, exactly, did his tutor do during those two hours? Unable to contain his curiosity, he managed to obtain a key to the priest's study and open the door. The moment the prince saw his teacher, he stood staring in a state of shock He could not believe that it was his teacher, the priest, who was sitting at the table and studying Torah dressed in a tallit and tefillin. The priest, as well, almost fainted from fear. It was only after the prince promised the priest that he would guard his secret that he was finally able to give a sigh of relief. The prince begged the priest to teach him Torah. After they began to learn together, the prince realized that he had finally discovered the deep wisdom he had always been searching for. His life took on new meaning, and one day he came to the conclusion that he, too, would like to become a Jew. As soon as the prince came to that decision, he begged his father to allow him to travel and see the world. When he left his father's house, he quietly crossed the border and found a yeshiva where he could continue to study uninterrupted. Within a few months he had converted and spent the rest of his life as a religious Jew, studying Torah and performing mitzvot. After a long life, the prince passed away and was escorted by the angels directly to the Heavenly Throne. From there, he was to be taken to the section of Gan Eden that is reserved for the greatest tzaddikim of each generation. Suddenly, a prosecuting angel stood up and said, "For the first two years of his life, this holy soul was nursed by a non-Jewish woman." It was decreed in heaven that before this soul could ascend to its proper place in Gan Eden, it would have to return to this world and be nursed by a Jewish woman for two full years. The Baal Shem Tov gently looked at the grieving woman. "And you," he told her, "were chosen to nurse this holy soul." The young woman was comforted by the Baal Shem Tov's words. The Baal Shem Tov would shake violently during his prayers. One time, just before the Baal Shem Tov began to recite the prayer for rain that is recited on Shemini Atzeret, the last day of Succot, his disciple, the Maggid of Mezritch, straightened out a wrinkle on the Baal Shem Tov's white kittel. The moment his hand touched the Baal Shem Tov, however, he began to tremble so violently that he had to grab hold of a table to steady himself. The Baal Shem Tov often accomplished miracles during his prayers. One Shabbat morning, the Baal Shem Tov repeated the verse, "Sham is the horse for salvation" (Tehillim 33:17) over and over again. Later that day he explained to his chassidim that a certain Jewish peddler, who had not managed to arrive home before Shabbat, was spending Shabbat alone in the forest. A bandit had discovered him and was planning to rob and kill him. "However," continued the Baal Shem Tov, "when I repeated those words, the robber lost his way, and the Jew was saved." One time, after the Baal Shem Tov died, the Chasidim were relating miracles that the Baal Shem Tov performed. The next day, Reb Tzvi, the Baal Shem Tov's son, told them that his holy father came to him in a dream and said to him, "Rather than repeating miraculous stories, they should speak about my Yirat Shemayom, fear of Heaven." Because the Baal Shem Tov did not write down his teachings, they are only known today through the writings of his disciples. Reb Yaakov Yosef of Polonoye published Toldot Yaakov Yosef, Porat Yosef, Tzafnas Panieach and Ketonet Pasim. Together, these works contain literally hundreds of direct quotes from the Baal Shem Tov. Other major sources for the teachings of the Baal Shem Tov are Keter Shem Tov, Tzavaat Harivash, Maggid Devarav L'Yaakov, Degel Machane Ephraim and Ohr Hamei'ir. The Baal Shem Tov contracted his final illness on Pesach, 1760. He passed away six weeks later on Shavuot at the age of 62. His son, Reb Tzvi, was unanimously accepted as his father's successor. On the Baal Shem Tov's first yehrtzeit, Reb Tzvi stood up in the presence of all his disciples and turned to the Maggid of Mezritch. "Last night," he told him, "my father appeared to me in a dream and told me that you are destined from heaven to be the new leader of the chassidim." Reb Tzvi then removed his special white rabbinical coat and placed it around the Maggid's shoulders. The Baal Shem Tov's daughter, Adel, was married to the tzaddik Reb Yechiel Ashkenazi. They had two sons, both of whom were renowned tzaddikim: Reb Moshe Chaim Efraim of Sadlikov, the famous "Degel Macheneh Efraim"; and Reb Baruch of Mezibuzh. Their daughter, Faigie, married Reb Simcha, and they gave birth to Rebbe Nachman of Breslev. The entire Chassidic Movement is based on the Baal Shem Tov's teachings and stories. They have remained an inspiration for the hundreds of Chassidic leaders and their disciples who continue to use the wisdom of the Baal Shem Tov to face the many challenges of the 21st century.